Many people are looking to improve health. They are suffering with pain or have other types of symptoms like low energy, high blood pressure, headaches, fibromyalgia, can’t sleep, stiffness, tight muscles, digestive issues, allergies, PMS, the list goes on and on. Most treatments are based on taking a pill that masks any of those symptoms. But there is a better way to improve health! We take a different approach to health and wellness. 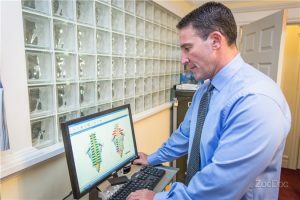 We do a complete, thorough exam starting with a computerized test that shows where there are imbalances in your nervous system. Your nervous system controls all functions of your body. If there are misalignments in your spine called subluxations, it interferes with the messages going from your brain to ever muscle, organ, tissue and cell in your body. This causes disease and dysfunction. We do a state of the art computerized test that helps find the cause to improve health of a patient. Once we see your imbalances, we look for the cause with orthopedic and chiropractic tests. Checking your range of motions in the neck and back tell us if the joints aren’t moving properly. The other tests help show if you have disc problems, nerve problems, muscle imbalances, tight muscles, problems with the ankles, feet, knees and hips. After we complete these tests we can then work to correct each imbalance to correct your symptoms! Your health issues and pains didn’t occur overnight. They will take time to correct. Balancing your spinal joints and supporting tissues is like a person getting braces to straighten the teeth. IT TAKES TIME! If you remove the braces too soon, the teeth will go back out of alignment. If you don’t complete a corrective treatment plan, the symptoms will return. So, don’t base your treatment and health on the symptoms only. Symptomatic relief is only temporary and if it’s with medication can cause harmful side effects. Chiropractors evaluate patients to find the cause to get results that most other practitioners fail to deliver. If you want to improve health and help others, share our message!